It’s like the most scrumdiddly chocolate banana bread except…puddin’! In my I Have Been Changed For Good and follow-up Feeding Your Soul posts, I pledged to change things around these parts. I pledged to personify my passion for food via more FUN recipes, more FUN food that reflects my overall outlook on eating and the happy eats I enjoy a daily basis. If you know me at all, you know I do not eat to live. I live to eat. That means that while I love a good salad or veggie burg, I love my cocktails and molten lava cake equally as much. I swear you can have both. They are mutually exclusive no longer! Life is equal parts kale, hardships, sweat, tears, learning from mistakes and cake, coffee, great friends, self care and vacations to the tropics, yo. Sometimes I’m totally satisfied with a peanut butter zucchini brownie or three and sometimes (read: often) I want a legit, veggie-less, freaking REAL dessert in every sense of the word. Alas, Chocolate Banana Bread Pudding was birthed. One that truly feeds not just my belly, but my mind and my spirit. I’m so, so happy about how dreamy this came out. It’s just sweet enough, super moist, and all around scrumdiddlyumptious with notes of warm cinnamon and speckles of semi-sweet chocolate chips that I straight up SWOON over. My first instinct was to make a decadent loaf of nanner bread packed with caramelized bananies and all the chocolate chips. Then I remembered that OH YEAH, banana bread has no milk in it. 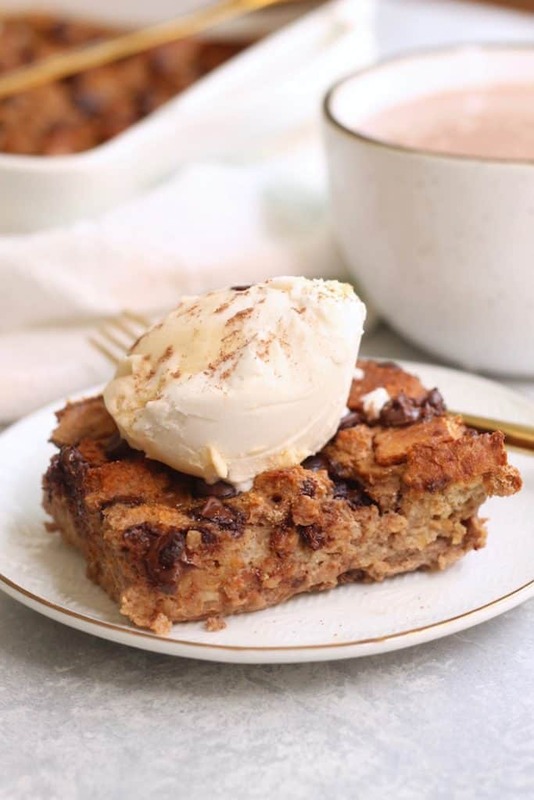 Bread pudding is one of those that’s-too-hard-to-make-at-home-so-I’ll-save-it-for-restaurants kind of desserts. But why? It’s actually not hard at all. I used this recipe as inspiration. It was one of the easiest recipes I’ve made like, ever. Stir or blend together the milk, bananas, eggs, vanilla, and cinnamon. Pour over cups and cups of torn bread cubes. Dot with chocolate chips and walnuts or pecans or coconut or white chocolate or raisins or a RUM GLAZE?! Now listen here. 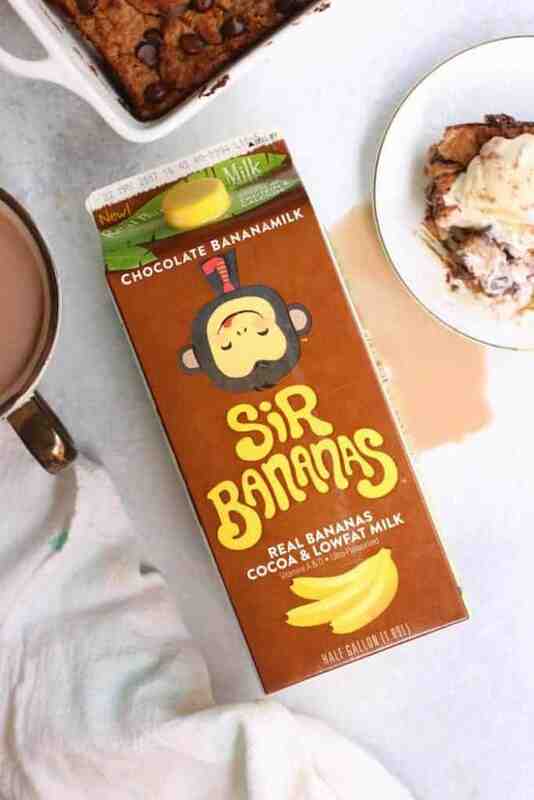 If you don’t have monkey milk on hand (use this store locator to find it near you), you can still partake in the fun. Use a cup and a half of whatever milk you please (almond, soy, whole, whatever) and add a couple tablespoons of cocoa powder (or leave that out if you don’t want chocolate), a ripe mashed banana, and a couple tablespoons of sweetener (sugar, coconut sugar, maple syrup) to the mix. I haven’t tried it yet, but I’m guessing that would work rather swimmingly. Kapeesh? If you try this, lemme knowwwww! This recipe ain’t vegan and it sure as hell ain’t gluten-free. And that’s peachy! Nonetheless, I know a lot of my friends and readers have allergies and/or dietary restrictions so rest assured that this recipe can definitely be made with gluten-free bread and/or dairy-free milk, like chocolate almond or soy milk! Yumz. Note that this recipe isn’t overly sweet. If you have a honking sweet tooth, feel free to double the maple syrup. For all my vegan lovelies, I’ve unfortunately never met an eggless bread pudding. I think it helps with the classic custardy dream texture. If you know of a substitution (maybe silken tofu, ground flaxseed, etc), feel free to experiment and let me know how it goes! I used a 7-grain baguette for the bread but anything should work. The older the better. Side note: To all my fellow Jewish people, I totally didn’t realize this post was going to go up during Passover until yesterday. Matzah version coming atcha next year! Swoon swoon swoon and three more cups of SWOON. Chocolate Banana Bread Pudding for president. Plus ice cream on top, duh. 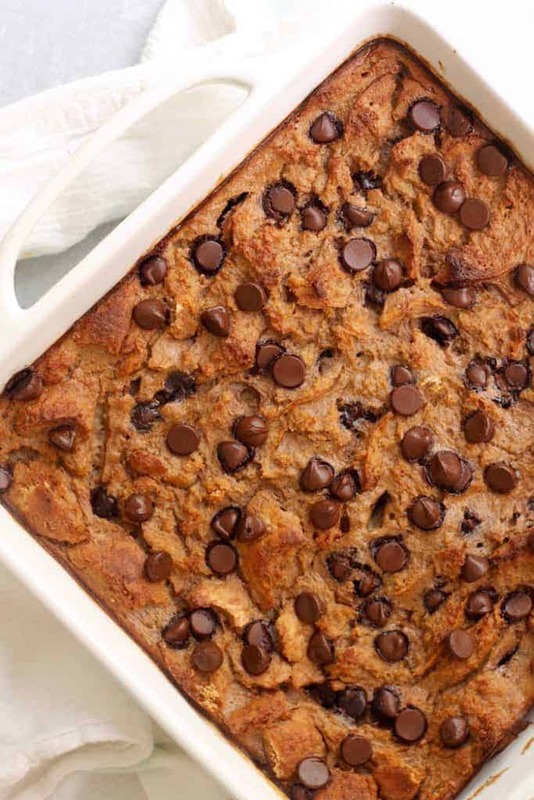 A super easy, tasty, and moist Chocolate Banana Bread Pudding made with ripe bananas, whole grain bread, and chocolate chips that the whole family will love! Preheat oven to 350F. Grease an 8x8in baking dish with cooking spray. Chop or tear bread into cubes. Place in baking dish. In a medium mixing bowl or blender, add chocolate bananamilk (or below substitution), bananas, eggs, maple syrup, vanilla, and cinnamon. Blend until smooth or stir until very well-combined. Pour mixture evenly over bread cubes. Top evenly with chocolate chips. Let sit for 10 minutes. Bake for 50 minutes to an hour or until a knife comes out clean (mine took 55 minutes). Let cool in pan on a wire rack. Top with ice cream if desired and serve warm or cold! Check out SirBanans.com + like on Instagram and Facebook for more recipe inspiration! This is a sponsored conversation written by me on behalf of Sir Bananas . The opinions and text are all mine. There is such thing as chocolate banana milk? Well, that’s kinda genius. YUM! I have a friend who is literally in love wth bread pudding. Going to pass this their way!! Chocolate chips are a mmust on eveything for me! I call it monkey milk too!!! :) love the stuff!!! Can’t wait to whip up this bread pudding. Thanks! Thanks so much for reading, Susan! I just bought some monkey milk (plain, my store didn’t have the chocolate) and I can’t stop drinking it!!! I was probably 8 the last time I drank a glass of cows milk, but this stuff is soooo good! 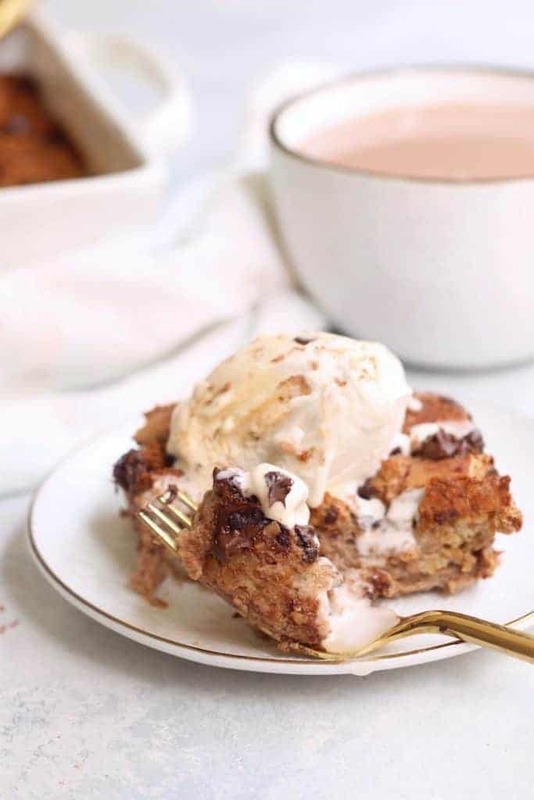 Super excited to make this bread pudding soon. Thank you! i was impatiently awaiting this recipe when you teased it yesterday and MAN does that look good. i love that it’s not too many ingredients/steps, either! i totally saw the banana milk at the grocery store and thought it would probably taste good with cereal, but i don’t eat enough cereal to justify buying a carton. now i actually might be able to :) thanks for sharing! My kind of pudding! Love the idea of using chocolate banana milk! Looks amazing! Can’t wait to try it. P.S. I love lOve LOVE your new focus. I’m sure it’s freeing for you and it’s freeing for your readers, too! I’m grateful for people like you who are encouraging people to just LIVE. Thank you, thank you, thank you. This recipe looks so good! I just want to make sure if i understand correctly. If we don’t have banana milk we can sub it with what you listed on your note section right? plus other ingredients listed, correct? *can sub 1½ cups milk of choice + 1 very ripe mashed banana + 2 tbsp cocoa powder + 2 tbsp maple syrup (or sweetener of choice) = 2 cups banana milk? Yep, you got it! Others have substituted 1 cups of chocolate coconut/almond/soy milk for the banana milk (and didn’t add the additional substitutions) and have had great results :) It’s a pretty fool-proof recipe!